Note that details here may include unverified reports and are subject to later updates or corrections. Last updated 14 Dec 2009. See also July-Aug 2009, Jan-June 2009, 2008, Sept-Dec 2007, June-August 2007, January-May 2007 & earlier records (2006) . 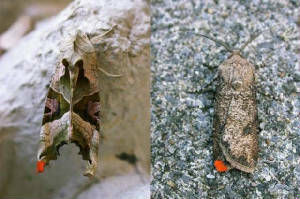 National Moth Night(s) Fri 18th & Sat 19th Sept 2009 (and later! ): please look out for (and photograph) colour-marked moths (from 3 sites in Tramore Bay, Co Waterford - orange paint on varius parts of left wing - and various sites in Britain). See further details.